I'm traveling to the UK soon, and I plan on buying a prepaid SIM when I get there. If I buy one from a vending machine at the airport or train station, what physical size SIM cards are typically available? I don't want to find out that none of them work in my phone. My phone uses the micro-sim size. Most likely it will be a SIM that can be a range of sizes (depending on how it is popped out). I would be surprised if you couldn't find one that fit at least a micro SIM slot. Certain airports do have vending machines, but a better bet would be to just buy one at the checkout of a store (supermarkets and places like B&M have them), or go into a phone shop and buy one. Just about every town here has multiple phone stores. In the worst case that you end up with only a nano-SIM, adaptors are easily available (e.g. from phone repair/unlocking shops, some supermarkets). I was in the same position (in the UK) as my old phone took a nano-SIM and my new one is dual SIM but the nano-SIM slot is needed for an SD card instead. They are nearly always provided so you can push out the size you need, but I've found the perforations to vary within one card, so that it's too easy to push out the nano-SIM. Most of the mobile-phone repair shops will have a jig to cut a mini-SIM to a micro-SIM, and will do it for a small fee. 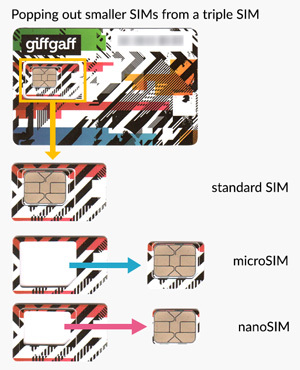 A nano-SIM is slightly thinner than mini/micro SIMs (and the pads a slightly smaller as well), so a micro can't easily be cut to a nano. Not the answer you're looking for? Browse other questions tagged uk cellphones or ask your own question. Micro SIM cards in Vietnam and Cambodia?